price £7.95 or a bit more or less has been published in November 2013. 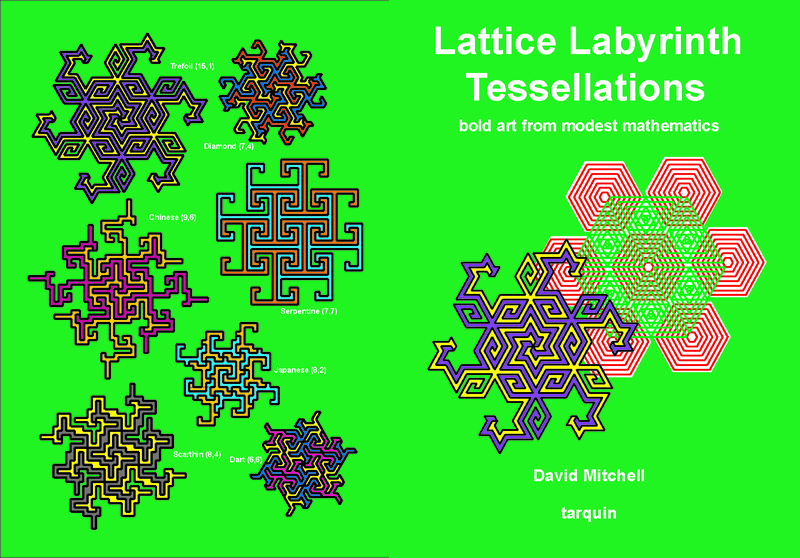 This is the Entry Level book, a guided workbook which starts from the basics and shows you how to construct some of the amazing families of Lattice Labyrinths for yourself. These repeating patterns MUST be employed to pave public spaces as floor sculpture or to tile walls in patterns so much more intriguing and inspiring than those usual seen but unnoticed. Pavings made of equilateral triangular tiles are perhaps the more attractive, you might say feminine, as opposed to the more austere-looking designs based on square tiles. Such triangular tiles, or pavers, are however unobtainable off-the-shelf, not that that would deter the architects of prestige projects. The other use for Lattice Labyrinths is as striking logos for clothing or repeating designs for fabrics. Many of the constituent supertile shapes lend themselves to Escherisation (Escherization in the American), that is to being transmuted into organic figures. I believe that, despite its accessibility to anyone with a bit of secondary school mathematics or an eye for geometry, this is a NEW field, or at least a field that has remained hidden – you won’t find it in the popular sourcebooks or webpages of repeating patterns or in the standard works on tessellations/tilings (it’s too elementary for them) or in the hundreds of works, popular or academic, on mathematical recreations. With respect, most of what is in most of these latter books is recycled from earlier work by such greats as Dudeney, Rouse Ball , Gardner or Conway. That hasn’t stopped me amassing a considerable collection of these fun maths books (YES – mathematics CAN be such fun) . A library of these line the walls of the Rapunzel Tower in which the short-haired author works; I’m slowly getting round to listing some on the bibliography page. Here are the front and back covers – it’s A4 format, 48 pages, every shade of grey inside.